People would be surprised to know that on the days when you ask what I have done today and I reply glibly with “Oh, a little gardening, a little reading, a little knitting…” and you think how spoiled she is, how lazy… what I am not telling you is that those days are the ones filled with pain to the point where I cannot stand to move, to stand, to sit, or even to lie down. I go out in the garden and let the touch of the plants be a sort of meditation, grounding me to my surroundings and reminding me that I am but a tiny piece of the glory that is our universe. I read as an escape from my current reality of agony, and as a distraction, and as a pleasure in the midst of pain. And when that escape is no longer working, I knit, to keep my hands from clawing at the ants buzzing around under my skin, and to keep my mind busy enough with knit three purl two that it won’t get lost in negativity. I think people would also be surprised to know that pain doesn’t have to be an excruciating pain to have a profound effect on your life. If you want to know what it is like to be in my body, try this for a while: Add a pebble to your shoe. It isn’t much, really, just a little thing. An aggravation in your shoe. I saw a campaign on the web that suggests putting a clothespin on your finger and seeing how long you can stand it. At first, it is a minor pain. An annoyance, really. An irritation. An aggravation, perhaps, if you succumb to anger. But after a while, the pain dominates your thinking if you let it. All you can think about is how long until I can take the pebble out of my shoe. You start trying to walk differently, trying to avoid the thing that causes pain, but then other parts of you start to ache because you aren’t using your body the way it is supposed to be used. So you go back to walking normally, pretending the pain doesn’t exist. You walk slower, but when that doesn’t work, you walk faster. You buy better shoes. You lean on a cane for a while. You take Tylenol, and Advil, but the pebble is still there. You try hopping. You try crawling. Still a pebble. Mind over matter, you tell yourself. Meditation. Breathing. Hypnosis. And a pebble, still in your shoe. “You don’t have acute pain, you don’t need strong drugs,” the doctor tells you, and you can see him thinking don’t you know there are people who are in serious pain out there? Stop whining. “What’s the matter with you?” your boss asks, “Your mistakes are costing me money!” and you want to scream can’t you see the pebble? But of course no one else can see it. Most don’t even believe it is there, not all the time. It couldn’t possibly be. Those who do believe don’t understand why you don’t just take a Tylenol and make it go away, like they do with a headache. Pain is conquerable, after all. We have the technology, they say. Because the alternative is too scary to contemplate: What if the pain never goes away? 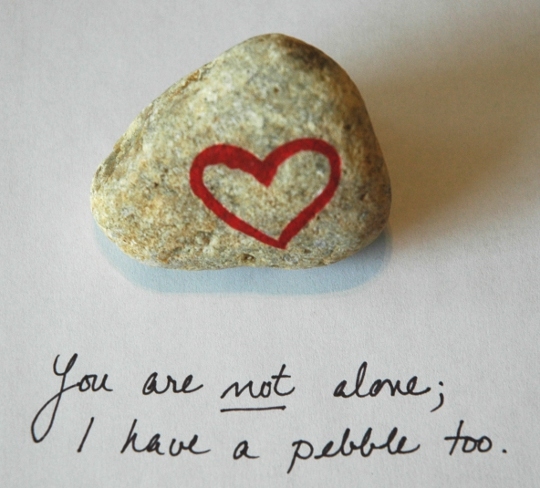 What if I’ll always have a pebble? It won’t make their pain any less. But it will make it less frightening. Less lonely. Hopefully they will begin to see all the things they can do in spite of their pain, rather than all the things they have had to give up against their will. Hopefully they will see that, in spite of the pebble, they can still be the kind of person they want to be. That, even with a pebble, life is still good. I am not in the habit of talking openly about the fact that I live with chronic illness, but over the past few years I have come to realize that having lived with chronic illness for over a decade now, I actually have something to say about my chronic invisible illness experience. I first talked about it back in 2009 when a meme went around for Invisible Illness Week, and I posted the meme here about a year later. That post still gets regular hits, has been quoted in quite a few different places, and was even read aloud at a medical convention on pain, to my great surprise. I posted the most relevant (and most often quoted) pieces above, but that is by far not the only thing I have said in this space about pain. To better help others who are living with chronic illness, and to help those who love them gain a little bit more understanding, I have collected links to my writing on invisible illnesses and some other useful links here. Can a pebble be a mascot? Would You Pick Up A Pebble? Casey at Moosh in indy – read this piece if you read nothing else on her site. This blog is listed in the Fibro Blogger Directory.